TARGET in Green!-9.75 in. tall x 3.75 in. base diameter. TARGET in Mgld. 3.75 in. high x 6.25 in. across opening. 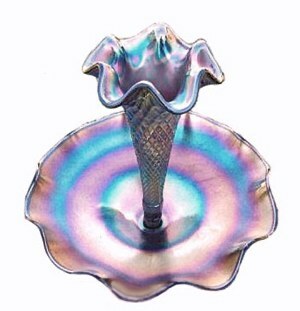 TARGET: The carnival version of this vase appeared in the mid-spring 1909 Butler Brothers wholesale catalog. It continued to appear in their ads through 1924. Popularity of the design spanned both the Dugan and Diamond production period. Size ranges from a squat, widely flared, 5”-6” version, extending to a tall, 13”- 14” swung type vase remain desirable to collectors today. Marigold, peach opalescent, and white seem to be the most available colors. The squat version in white turns up fairly often. Amethyst is a difficult color to get. Cobalt blue is another color rarely found. Rarer still, are the vaseline base with marigold overlay. Very few green Target examples are known. Lime green opalescent and vaseline opalescent share a tie situation since only one of each color is known. Click on - - in our pattern alphabet to take a look at the vaseline opalescent vase with marigold overlay. 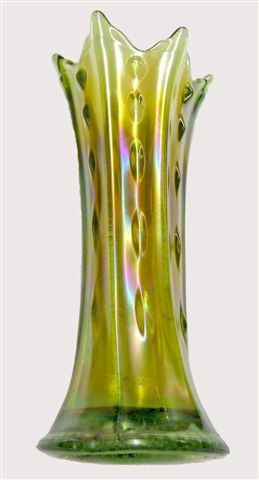 CIRCLE SCROLL Vase - 6.75 in. tall. CIRCLE SCROLL: This pattern is known in a berry set, water set, compote, hat shape and swung vases. Both the hat shape and the vases were fashioned from a tumbler. Colors are confined to amethyst and marigold in all cases. All shapes are scarce. 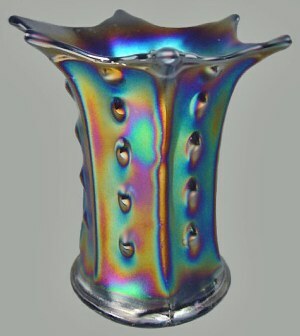 Circle Scroll realized extensive production during the opalescent period, with subsequent carnival glass production occurring early on, probably during the 1909-1910 period. 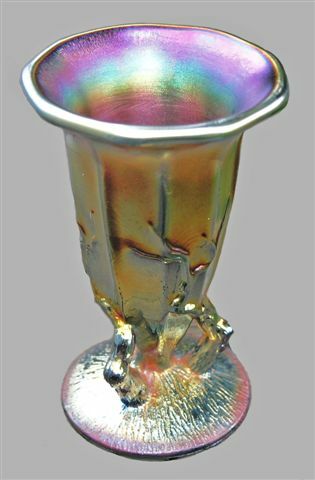 Click on - - in our alphabet for a look at an amethyst Circle Scroll vase. TINY TWIGS: Yes, these little darlings are quite rare in any of the ruffled top, jack-in-the-pulpit, or tight-crimped edge! When it comes to this round opening, such as the lovely example provided by Don and Kristine Dorais, we believe it to be extremely rare! Should any of you know of another with this type opening, we should like to hear from you. Amethyst and marigold are said to exist, although during our many years of search we can honestly say we have never seen a marigold TINY TWIGS. Carnival production likely dates circa 1909-1910. Their rarity indicates a short production run with no evidence indicating production continued after the Diamond takeover. 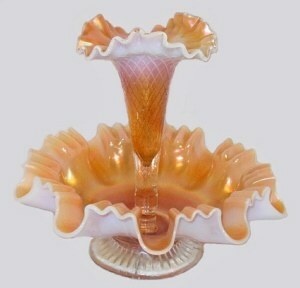 The opalescent version appeared in the April 1906 Butler Brothers catalog and in the 1907 Dugan factory catalog. Click on - - in our alphabet to have a look at the tri-corner shaped top. 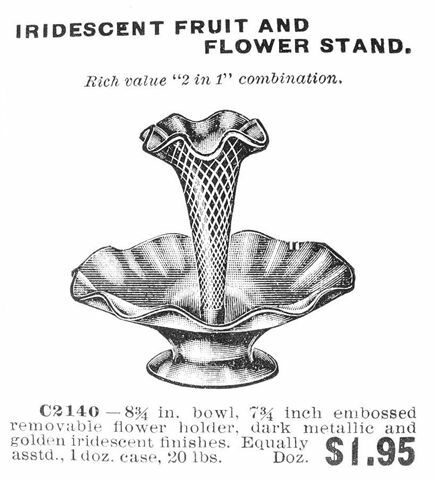 FISHNET Epergne as shown in Spring 1912 Butler Bros. Wholesale Catalog. STRAWBERRY EPERGNE: Notice that the design appearing on this single lily epergne is of criss-crossed diamonds at the topmost portion. The lower part is patterned with rows of raised studs, showing remarkable similarity to the design used on the Formal vase. The dome-footed base is covered with strawberries and leaves. Eagerly sought, rarely found, and as with all carnival epergnes, command attention when offered for sale. 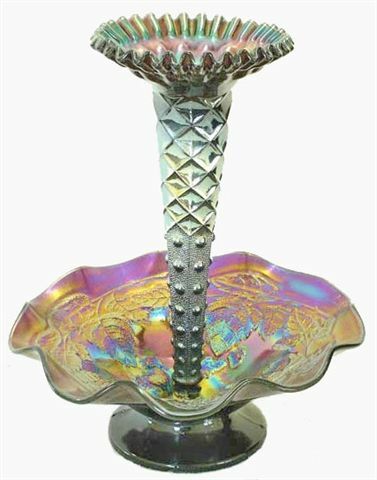 Production of this carnival epergne, found only in amethyst, is probably circa 1909-1911, offering every characteristic of Dugan design. WIDE RIB vase - often called Pinched Rib by collectors. 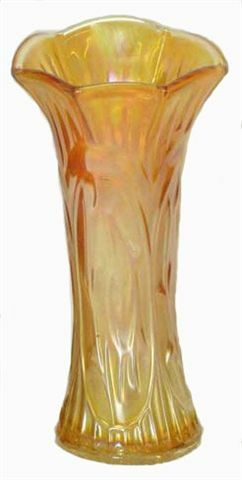 WIDE RIB: Extending through the Diamond years of production, this version of the Dugan Wide Rib vase must have been extremely popular with consumers. 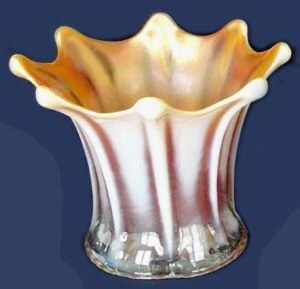 It appeared in 1909 production, with examples continuing to appear in the wholesale catalogs as late as 1931. Northwood and Westmoreland produced similar vases. The Northwood version has wide ribs which end just shy of a raised ridge along the top. The Westmoreland version, called Corinth has ribs slightly wider and more bulging, close to the base. 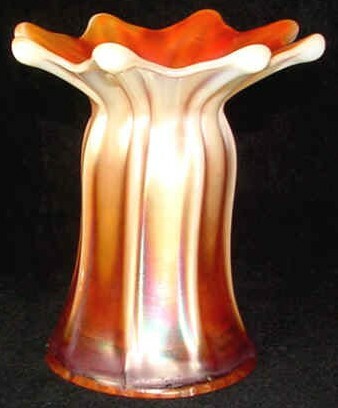 Dugan's version offers ribs which go all the way to the top of the vase, culminating in a ball-shaped bulge at the very top. Note: Marigold, amethyst, peach opalescent, cobalt blue, green, aqua, vaseline w/marigold overlay are the colors for vases in the 4”- 14” size. 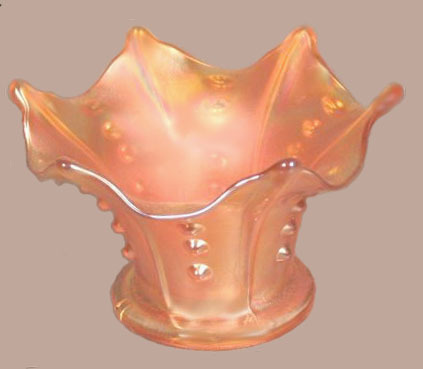 The PINCHED RIB version is found only in peach opalescent. (Genesis 12:1-9) deals with what we are called to do with our lives. “It is still the duty of all believers to sever connections with anything that hinders our spiritual progress and effectiveness. We must forsake all sin, all self-will, and every worldly pleasure that draws our heart away from God.